Spotify deja vu: is video killing the radio star again? This article was originally published via The Guardian Media Network. Our world is being transformed by technology, but history, as the latest Spotify announcement shows, is destined to repeat itself. In 1981, Viacom launched MTV. It used footage from the first moon landing and the song Video Killed the Radio Star to make it clear to the music labels and advertisers that it meant business. Before MTV, the music business (with the help of radio) was doing well. But video quickly took the industry to new heights. Fueled by the new medium, global music sales revenue quadrupled, before losing steam due to the new hip technology called the internet (and piracy). Born in 2006, Spotify was the Swedish knight in shining armour using secret weapons like freemium and streaming to save the music industry from piracy. Last week, that knight called in the cavalry in the form of video streaming. Just like in the 80s, the music streaming business was doing OK (Spotify generated $1.3bn in revenue each year and is currently valued at $8bn), but the future was looking challenging – the company tripled its losses since 2012 and with Apple launching its own service in a few weeks – who knows when Spotify will turn a profit. For a company that is hoping to have its stock market launch soon, that’s an unbearable thought. Spotify is trying to position its announcement as an evolution (not a revolution) of its business. Something along the lines of “music was just the beginning, now we will add TV clips and podcasts to create an entertainment platform”. One could say that Snapchat made a similar move a few months ago when it began offering video updates on top of its messaging app. Spotify’s move, however, is quite different. Spotify is, first and foremost, a music service. Not just a distribution platform. If we know one thing about Spotify’s massive user base, it is that they love music. But interestingly, in the press event last week, where the video feature was announced – music took the back seat. 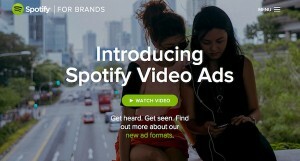 When showcasing some of the new video content, Spotify chose to highlight short clips from comedy TV shows like Broad City and not music videos or interviews with artists that complement Spotify’s core offering. It seems as if in Spotify’s video realm, TV killed the radio star yet again. The reasoning for going into the video ad business is well understood. US mobile video advertising spending grew 50% last year to $1.54bn . Advertisers love to be associated with hip shows like Broad City and since this content is in limited supply, video CPMs on premium content in direct deals now average $32.80 – that’s about three times more than the average mobile and general display premium ads. Now take into account that total digital video ad spending is set to more than double in the next three years and you will understand why Spotify is betting on video. The truth is that monetising music with a freemium business model is hard. Pandora, just like Spotify, is also sweating to make it work. From a product design standpoint, there is something almost unfair in this story, since Spotify did a great job in designing a fantastic music experience: the catalogue is huge, the device support is superb, the playlists are great for sharing, the play queue is a cool tool for occasional DJing, the user profiles are what social discovery is all about and the recent announcement of Spotify Running makes perfect sense. And let’s not forget the best part – much of this is available for free. But all of that wasn’t enough and so Spotify had to change focus and expand its content offering. Maybe last week’s press event doesn’t mean that much and music fans have nothing to worry about. Maybe Spotify, just like MTV in the 80s, will take content streaming business to new heights with the introduction of video. Maybe Spotify, like MTV in its heyday, will be as innovative with TV clips as it was with the music streaming experience. Maybe it will even challenge YouTube’s viewing experience that hasn’t changed much over the years. But those are all big maybes. One thing is clear – Spotify must make TV clips work with music. One will not work without the other. Just look at what happened to MTV once it lost all interest in music and its core fan base to focus solely on reality TV – it’s dying. With millions of music fans who love Spotify and are looking forward to a bright new age for the industry, one can only hope that Spotify knows what it’s doing and that history will not come full circle.